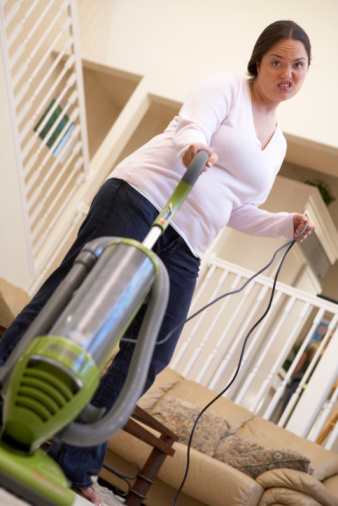 Keeping your home clean starts with having a good vacuum cleaner to keep your floors and carpets dirt free. The Shark Navigator is a lightweight upright vacuum that you to push to clean your floors. The vacuum will come in pieces that you will need to assemble before use. You can also fix any problems you might have after it is put together by following a few troubleshooting steps. Place the floor portion of the vacuum on a flat surface. Line up the tube coming up from the floor portion with the tube coming from the bottom of the detachable canister portion of the vacuum. Slowly push these two pieces together until you hear a click. Place the bottom of the extension wand into the top of the tube running up the back of the canister. Push it down until the two pieces click together. Slide the accessory holder over the extension wand and move it down until it rests on the brackets. Place the top handle of the vacuum on top of the extension wand and push down until it clicks into place and the two pieces are attached. Stick the end of the hose into the connector located on the back of the canister. Place the accessories into the holder according to their shape. Check the dust cup on the back of the vacuum if it is no longer picking up dirt. If this cup is full, remove it, empty it into the trash and place it back in its place. If this does not fix the issue, check the hoses and connections to ensure there are no blockages. Move the suction release lever to the "Open" position to reduce power if the vacuum picks up or moves lightweight carpet or rugs. If the problem continues after reducing the suction power, move the "On" switch to the "Suction Only" setting when vacuuming these carpets. Move the suction release lever to the "Closed" position if it seems like there is not enough power to clean thick carpets or very dirty floors. If this does not increase the suction power, check the suction cup and empty it if necessary. Make sure there are no clumps or blockages in the inlet of the suction cup or any of the hoses.